Jane Shore was one of the first female commoners to make her own smudge on the pages of history. Her name was, in fact, Elizabeth (Jane was probably a pet name) and we are fortunate to have some record of her life and background. The daughter of John Lambert, she was born in about 1450. John was a liveryman of the Mercers’ Company. The Mercers were one of the richest of the merchant companies that controlled the commercial life of London. Originally they dealt in woollens and worsteds but by the 15th century they had expanded into merchant adventuring, importing a variety of textiles, mostly through Antwerp and the Low Countries. John was apprenticed to a Thomas Onehand in 1436 and by the late 1440’s was married to Amy, the daughter of a rich grocer, Robert Marshall, of the parish of Cripplegate. The marriage produced six children to survive infancy, four sons and two daughters, of which Elizabeth (Jane) was the elder girl. In early 1460 John was elected to the office of alderman for the parish of Faringdon. These were hard times for the merchants of London. With the civil war between the Yorkist and the Lancastrian factions, known to history as the Wars of the Roses, the export of wool and cloth, to Flanders and through the English held French port of Calais, had fallen by two thirds compared with the 1440’s. In addition, the loss of Gascony by the blundering government of King Henry VI cut the import of wine, the international currency of the time, by more than a half. Despite the economic slowdown, John Lambert continued to prosper. According to the Acts of Court of the Mercers’ Company, he was elected as one of the two Sheriffs of the City of London for 1460-1. The Sheriffs were second only to the Mayor, enforcing orders from the Mayor’s Court for the collection of debts and Customs, the imprisonment of transgressors in Ludgate goal and supervising the execution of those condemned to death. Another of their duties was the mustering of the citizen’s militia – all freemen were liable for “ad hoc” military service when the need arose. These were troubled times and John would have been very much involved in high politics. The office of Sheriff would only have been held by a man of considerable respect and substance. It is an indication of John Lambert’s power and position. At Christmas 1460 Richard Plantagenet, Duke of York, was killed in the battle of Wakefield. A triumphant and rampaging Lancastrian army, led by Queen Margaret and the Duke of Somerset was pillaging its way south towards London. The Earl of Warwick, with a Yorkist army, and carrying the simple-minded King Henry VI as his sign of authority, left London to meet the onslaught at St Albans. The Yorkists were defeated and fled leaving the King, who had spent the battle laughing and singing to himself, to be reunited with his wife, Queen Margaret. The Lancastrian victory placed the officers of London in an extremely dangerous position. With an army of “northern wild men” on their doorstep and having given tacit support to the Yorkists, there was a distinct possibility that the city could have been sacked. One observer stated that the citizens “lived in mickle dread.” Negotiations were held and it was agreed by the Mayor and his officers (undoubtedly John Lambert, as a sheriff, was prominently involved in these) that in return for the good behavior of the Lancastrian troops, they were to be allowed to enter the city. The common citizens had other ideas. When elements of the army arrived at the gates the people rioted. On the advice of Dr. John Morton, later Archbishop of Canterbury under Henry VII, the Queen decided it prudent not to alienate the country’s capital city. She moved her army north to York. Edward, Earl of March, leader of the Yorkist faction since the death of his father the Duke of York, and Richard Nevill, Earl of Warwick, marched their troops back in to London on 27 February 1461 to a rapturous welcome from the citizens – and, no doubt, the great relief of sheriff John Lambert. It was now that the Earl of March took the fateful decision to seize the throne. He was crowned on Sunday, 28 June with all pomp and ceremony. The Mayor, Sheriffs and Aldermen proceeded by river from the City to the Palace of Westminster to join the procession to the Abbey. John Lambert would have attended the great banquet that followed in Westminster Hall; the senior officers of the capital were no doubt seated “above the salt” as a reward for their loyalty. On the Tuesday the new King attended Mass at St Paul’s. The handsome young man went in procession with his court through the City to the cheers of its citizens. Jane would have been about eleven years old and most certainly joining in the celebrations. This could well have been the first time she set eyes on Edward. For most of Jane Shore’s story we must rely heavily on the writings of Sir Thomas More. It would seem that he may have known Jane personally in her later years and More’s father, a barrister living in Milk Street, near the Guildhall, would certainly have known the family at this time. William Shore was born in Derby and apprenticed in 1452 to John Rankyn, a mercer of London. This would place his birth sometime between 1435 and 1440, making him as much as 15 years older than Jane. He was made a freeman of his Company in 1459 and a liveryman in 1464. More describes Jane at the time of her marriage as “Proper she was and fair, nothing in her body that you would have changed, but if you would have wished her somewhat higher. Thus say they that knew her in youth.” This was not a happy marriage. With Jane still a child, married to a man of twenty-six, More says that she was, “not very fervently loved for whom she never longed.” Above all, what doomed the marriage was that William Shore was impotent. Meanwhile, at court, the hunt was on for a wife for young King Edward IV. There were many candidates from all over Europe but the mighty Richard Nevill, Earl of Warwick, saw this as an opportunity to cement relations with England’s old enemy, France. Negotiations continued apace and all was reaching a satisfactory conclusion in early 1464. It was now that Edward dropped his bombshell. According to Robert Fabyon, “In most secret manner, upon the first day of May, King Edward spoused Elizabeth, late the wife of Sir John Grey, knight, which before time was slain at Towton or York Field, which spousals were solemnised early in the morning at a town named Grafton, near Stony Stratford; at which marriage was no person present but the spouse, the spouses, the duchess of Bedford her mother, the priest, two gentlewomen and a young man to help the priest sing.” Edward immediately consummated the marriage and returned to court as if he had been out hunting. The Earl of Warwick was enraged by the ill-considered action of the impetuous youth and it sowed the seeds of their eventual breach. Warwick was quick to realize that Elizabeth Grey, nee Woodville, came with considerable baggage in the form of a rapacious family eager for titles and lands. In September 1461, Elizabeth’s sister, Margaret, married the heir to the earldom of Arundel; the following January saw her 20 year old brother, John, marry the rich, dowager Duchess of Norfolk, a woman in her sixties. Over the next two years five further Woodville girls were married to peers of the realm. The most significant of these was Mary Woodville who married the heir to Lord Herbert in 1466. Herbert was the rival to the Earl of Warwick in Wales and controlled Henry Percy, heir to the earldom of Northumberland. A political alliance between the Woodvilles and the Herbert family spelt serious trouble for Warwick. Elizabeth was crowned queen at Whitsun 1465 and William and Jane Shore would have witnessed the celebrations from the city streets, though her father, John, would probably have attended the service at Westminster Abbey in his office as alderman. For the next five years the relations between the King and the Earl of Warwick went from bad to worse. On 1st August 1470 Warwick made his move. At Angers Cathedral he swore to “hold the party and quarrel of King Henry,” on a fragment of the True Cross. Edward had lost the man who had made him King. Over the next few months the country was rife with rumour, awaiting the inevitable Lancastrian invasion. The men of Kent, always stout supporters of their hero Warwick and loyal to the House of Nevill, came up from that county and pillaged the villages south of London. Warwick and Queen Margaret were reconciled by Louis XI, King of France, and the Earl, together with Edward’s treacherous brother, George, Duke of Clarence, landed at Plymouth in September. The Lancastrians marched into the Midlands, raising troops as they went. 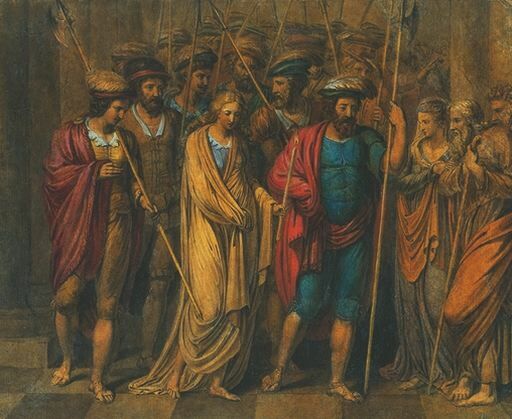 Edward, who was in the north, was caught by surprise and moved south to meet them with a mere 2,000 men. Realising he had no chance of victory, he embarked from King’s Lynn on 28 September for Holland ready to fight another day. In London all was panic. The mayor and aldermen met at the Guildhall on 15 September to decide policy and their reaction to the rapid change in events. It would seem that the atmosphere was for compromise with the Lancastrians. John Lambert was a staunch Yorkist and caused uproar at the meeting. As a result he was removed from office and fined 200 marks for contempt. A heavy price to pay for supporting Edward. Warwick and Clarence entered London in October 1470 and took control of the government. Edward, though in exile, was not friendless. His sister, Margaret, was married to Charles, Duke of Burgundy and, with that great European magnate’s assistance, Edward landed in March 1471. He marched from Yorkshire, through the Midlands and towards London, gathering support as he went. At Barnet, just north of the capital, on Easter Sunday, 14 April, The armies of the Yorkist King and the Kingmaker faced each other. Both realized that this was the vital battle that would determine who would rule England. According to the Chronicles, Edward attacked Warwick’s centre with such violence that “he bore down before him all that stood in his way. Blessed be God, he thus won the field.” Warwick was slain while attempting to escape the rout. Thus died one of the greatest magnates in the history of England. Edward had no time to enjoy his victory. Queen Margaret had landed at Weymouth with her son, the young Edward, Prince of Wales, together with an army from France.. King Edward was quickly on the march and pursued the Queen to Tewkesbury. There, on 4 May, the armies engaged. King Edward gained a complete victory. Many of the Lancastrian lords were either killed in the battle or executed in the aftermath. The most significant casualty was the Prince of Wales, the 17-year-old Edward, thus virtually bringing to an end the old House of Lancaster. His father, Henry VI, a prisoner in the Tower, did not long outlive him. Edward IV returned to London on 21 May and the 50-year-old King, sounder in body than in mind, was quietly put to death. Wealthy merchants of the Yorkist persuasion like John Lambert must have had a bad fright, though he was soon back in favour for he was elected as one of the four Wardens of the Mercers Company. Edward’s return appears to herald the start of Jane’s affair with the King. Sir Thomas More says, ”For a proper wit had she, and could both read well and write, merry in company, ready and quick of answer, neither mute or full of babble, sometimes taunting without displeasure and not without disport.” She appears to have been the ideal diversion for a prince with a jaded palette. According to More, the King’s “favour, to say the truth (for sin it were to believe the devil), she never abused to ant man’s hurt, but to many a man’s comfort and relief.” Jane was not a woman to abuse her position as so many have done in England’s history. More continues, ”Where the King took displeasure she would mitigate and appease his mind; where men were out of favour, she would bring them in his grace.” There is even a tale that she intervened to save Eton Collage and King’s Collage, founded by Henry VI, from destruction. This would explain why there were two portraits of Jane Shore at Eton Collage – one representing a naked figure near a bath, the other a bust. At King’s College, Cambridge, in the dining room of the provost’s lodge there was a picture of her naked bust, which appears in an inventory dated 24 January 1660. Regarding her marriage to William Shore, the merchant gained little from “laying down his wife for his country.” Indeed, Jane had been trying for several years to free herself from the impotent William. Her lawyers had taken her case before the Court of Arches a number of times but without success. Although the Dean of Arches was used to granting annulments in cases of affinity and coercion, Jane’s grounds of impotence seems to have been unique in the fifteenth century. The only course of action was to go to Rome and seek the support of the Pope – an extremely expensive procedure. The question one must ask is how did the wife of a middle class merchant afford such litigation, normally far beyond the means of many a lord or noble? The source of finance could only have come from the King. On 1st March 1476 Pope Sixtus IV instructed the bishops of Hereford, Sidon and Ross to hear Jane’s petition. We know little of the bishops of Sidon and Ross, but the Bishop of Hereford was a close friend of the King. Thomas Millyngton had been Abbot of Westminster when Edward was forced to flee as a result of Warwick’s invasion in 1470-1. The heavily pregnant Queen Elizabeth had retired with her daughters to Westminster Abbey for sanctuary. Millyngton housed them in his own lodgings and it was here that Elizabeth gave birth to her eldest son. On the King’s return to power, the Abbot was rewarded with the rich see of Hereford and a seat on the Privy Council. The decision was a forgone conclusion – William Shore bowed out of history and Jane became free. William left London to live between East Anglia and Flanders. He continued his business in cloth and wine and appears to have traded as far as Iceland. There is no evidence that he ever married again! As Edward grew older and corpulent, the sexual element of their relationship decreased and took on a more companionable nature. Jane was fun, witty, pleasant to be with. She relieved the King of his burden and sought no grasping reward. Toward the end of March 1483 King Edward fell ill. Our Italian friend, Mancini, suggests that it was a chill caught while attending a fishing party on the Thames. Whatever the cause, Edward IV died at Westminster in the presence of his trusted friend, John Morton, Bishop of Ely, on 9 April. We do not know Jane’s reaction to her lover’s death, though the event left her vulnerable. William, Lord Hastings, the late King’s closest friend and companion, took her under his protection. More says that, “When the King died, the Lord Hastings took her, which in the King’s days, albeit he was sore enamoured upon her, yet he forbare her, either for reverence or for a certain friendly faithfulness.” More also says that they “lay nightly” together. It is an unwritten rule of history that when a crown is usurped, the true incumbent must inevitably die. By June 1483 Gloucester had decided to take the throne. Given the close relationship between the late King and Lord Hastings, there was no way his lordship would sanction or stand mildly by at the murder of his friend’s sons. Gloucester’s coup was carried out with brutal efficiency. At a meeting of the council on Friday 13 June, the Archbishop of York and John Morton, Bishop of Ely were arrested and imprisoned in Welsh Castles. William, Lord Hastings, Jane’s brief protector, was executed on the orders of Gloucester. Thomas Grey, Marques of Dorset and son of Queen Elizabeth by her first marriage, had sought sanctuary when Richard of Gloucester launched his coup. Like Hastings, he was an admirer of Jane Shore and competed with his lordship to become her lover. At the death of Hastings he slipped out of sanctuary and went into hiding. There was strong suspicion that Jane aided his escape. She was arrested sometime between 13 and 21 June, but, with no proof against her, the regime fell back on the age-old charge of sorcery. Being a Freewoman of London Jane had the right to choose her prison. She selected Ludgate Jail, the one her father had had responsibility for while sheriff. She had friends in the area that could provide her with food. All her goods and property were attached by the sheriff of London. The charge of sorcery was laughable and was soon dropped but the vindictive King Richard III was determined to have his pound of flesh. The Great Chronicle of London reports that a woman named Shore was “as a common harlot put to open penance for the life that she led with the said Lord Hastings and other great estates.” One must assume that the last referred to Edward IV. On a Sunday (the date is unknown) she was forced to walk barefoot, clothed only in her Kirtle (fifteenth century underwear), through the streets of the City, carrying a lighted taper. Contrary to Richard’s expectations, she was cheered by the crowd who were “more amorous of her body than curious of her soul.” Jane was then released, but not for long. Ever the loyal friend, she appears to have aided Dorset’s escape from England to Brittany to join Henry Tudor. By the end of October Jane was back in Ludgate Jail. It is at this point that Jane meets her third protector and he was to come in the most unlikely guise. Lynon defied the displeasure of his King and married Jane, probably in early 1484. By the marriage Jane had placed her future, and had a vested interest in, the survival of Richard III. More states in the first edition of his History of King Richard the Third that she died in the eighteenth year of the reign of Henry VIII which would place the event sometime between April 1526 and April 1527. This would put her age in the mid to late 70s. She had outlived all her great contemporaries – Edward IV, Richard III, Lord Hastings, Elizabeth Woodville, Margaret Beaufort, even Henry VII. Perhaps she had lived too long – but what a colourful life she led!